An API KEY is now needed to make use of horoscope JSON API. Previous API has been deprecated and will be discontinued from 1st January, 2019. Please contact us for further details. You may now freely use and embed Ask-Oracle.com’s horoscopes on your website or blog using simple codes, wordpress plugin or custom horoscopes JSON API. Our horoscopes are reliable, based on time tested formulas of astrology and updated regularly. It takes less than 2 minutes in integration. No technical expertise required. Responsive layout and options to change look and feel. Best and easiest way to embed our horoscopes widget on your WordPress blogs and websites. Add to sidebar using widgets or main content using simple shortcodes — use our AstroPress plugin available in WordPress plugin repository. If you have a static website, use some other platform or simply can’t add a new plugin due to account restrictions, just copy and paste this tiny script on your page to display horoscope widget box and you are good to go. 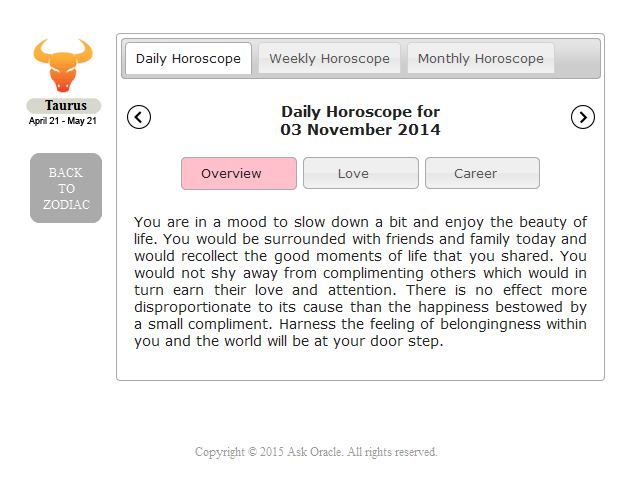 Above returns daily, weekly and monthly horoscopes content in JSON format. If you face any issues, please feel free to Contact Us. how can i remove copy right is it possible? We do offer a White Label solution that allows for removal of copyright and attribution requirements. Available as API or a monthly dump. Please contact us for pricing. You can use our APIs. i want to delete the copywrite, Can I will do that? Please use the API and give us the credit somewhere on the page. Currently only available in English and Hindi. Hello, i used this plug in on my metaphysical site https://mysticculture.com but I want to customize it. How do you recommend I do that? Please let me know. Thanks! Hi, exactly what customizations do you need? Would you like to match it to your site’s theme and color ? I would like to enlarge the over a widget. Also is there a way for me to replace the icons? Do you have new icons ready? Replacing icons isn’t possible without recreating the entire widget. We can make this change for a small fee. I am not sure what you mean by “enlarge the over a widget”. I have used this service on my website at http://bongoflavamp3.com and it looks good.